Note: This article complements one written by one recently posted at Colorin Colorado and written by Diane Staehr Fenner, Jill Kester, and Sydney Snyder. 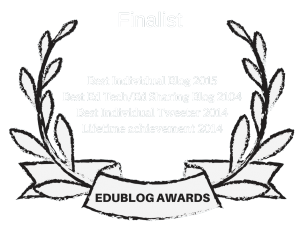 That piece is titled The Five Pillars of Equitably Grading ELLs. Larry will be joining Diane for a free Webinar on Equitably Grading ELs that will take place on March 19th. You can register for it here. Larry Ferlazzo and Katie Hull Sypnieski are teachers in the Sacramento City Unified School District and authors of several books on teaching English Language Learners. We must begin by saying that grades have seldom been an issue in our classes – whether they were ELD/ESL, mainstream, intervention, or advanced courses. Because of that experience, we are often bewildered by the amount of energy, pressure and angst about them that we see among many teachers and administrators. We view grades as information. They are one of many forms of communication we use with students and their parents, and definitely not the most important kind. As Rick Wormeli says, they are not rewards or punishments. We view grades as, in many ways, the lowest level of communication between students, parents and ourselves. As its Latin word root suggests, they are “steps toward something.” Assessments, however, are an entirely different kettle of fish. Its Latin roots mean to “sit beside” and to assist. 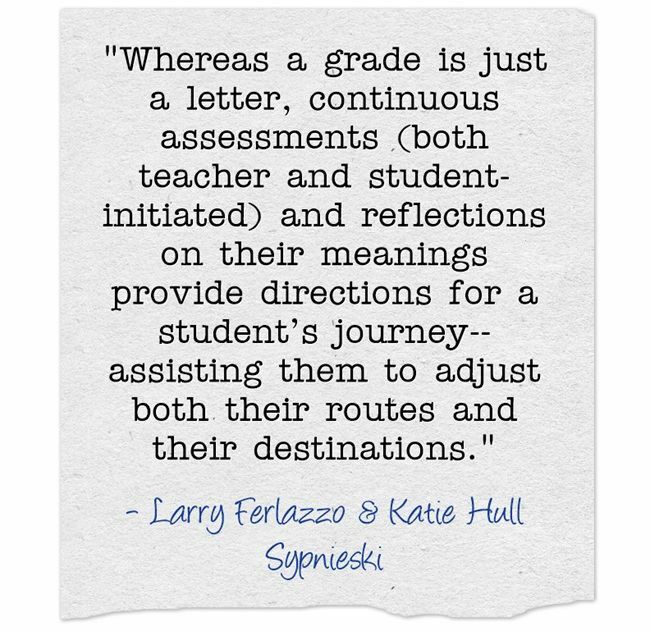 Whereas a grade is just a letter, continuous assessments (both teacher and student-initiated) and reflections on their meanings provide directions for a student’s journey– assisting them to adjust both their routes and their destinations. We emphasize building upon our students’ assets instead of their deficits. That doesn’t mean we ignore or minimize challenges they are facing. It does mean, however, that we focus on leveraging both their academic and non-academic strengths, like perseverance, critical thinking ability, appetite for learning, and success in outside-of-school venues, towards targeting needed areas of academic improvement. As most teachers know, highlighting past examples of student success and the steps that made it happen can go a long way in helping them find the appetite/desire to applying those qualities again and again – especially to further a high-interest goal. Just to be clear, even though some might consider us “easy” graders because of our perspective, we also feel confident – and proud – of our students’ results on “high-stakes” assessments, such as state tests and International Baccalaureate – supervised Oral Presentations and Essays. We base our grading structure in ELD classes (where students are all Beginner or Intermediate ELL students) on a Course Of Study that we helped our district develop a number of years ago. First, we must say that at this time, our own District does not offer grading guidance to mainstream teachers who have ELLs in their classes. We hope that will change in the near future. To our best knowledge, our state of California also does not provide guidance in that area. In addition, our experience is in middle and secondary schools, and we will focus most of this section in those areas. Federal guidelines make it clear that it is the responsibility of high schools to create a pathway for a student who enters high school as a Beginner to be able to graduate in four years (which is a particularly challenging timeline since it takes four-to-seven years to gain proficiency in academic English). They must graduate with the prerequisites to enter college. They must be able to attain success in the school’s “standard instructional program.” We can’t see how that is possible without a system of differentiated instruction and differentiated grading for ELLs in our schools. The federal government also provides clear instructions that accommodations on assessments must be made by states’ Departments of Education on any assessments administered to ELLs. Though those guidelines only specify state assessments, it doesn’t appear to us much of a stretch to believe that teachers should follow them in their own classes, too. We’re not experts, but we wouldn’t be surprised if a Civil Rights complaint to the Department of Education would result in the same opinion. It is the responsibility of the teacher to make content and assessments comprehensible to ELLs. No student should be retained because of English language challenges. These policies point out the difference between being “equal” and being “fair” and make it clear that treating ELLs “equally” by treating them the same as English-proficient students is not “fair” and could even be unlawful. If a student is struggling with sequential vocabulary, they may not be able to write an essay on the water cycle. However, if given the opportunity to do a hands-on type of assessment through experimentation or pictures, the same student may be able to demonstrate knowledge of that content, confirming for the teacher their knowledge of science, not their limitations in English. Accommodations during class could include differentiation strategies such as providing more time, allowing access to cellphone translation, providing needed background knowledge though home language materials, offering similar texts at different lexile levels, giving students writing frames and sentence starters, pre-teaching key vocabulary, speaking at a slower rate, and recruiting peer tutors or in-class language “buddies” – just to name a few. Larry spent nineteen years as a community organizer prior to becoming a teacher. 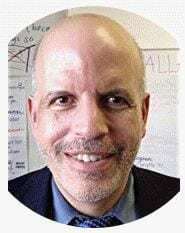 As an organizer, he recognized that “we live in the world as it is, not as we would like it to be.” That doesn’t mean we have to be cynical, but it does mean that as we continually strive towards how we should treat all ELLs, we also have to recognize that because of time pressures, lack of professional development, and just plain overwork, some mainstream teachers might not be able to provide the differentiated instruction needed by ELLs. 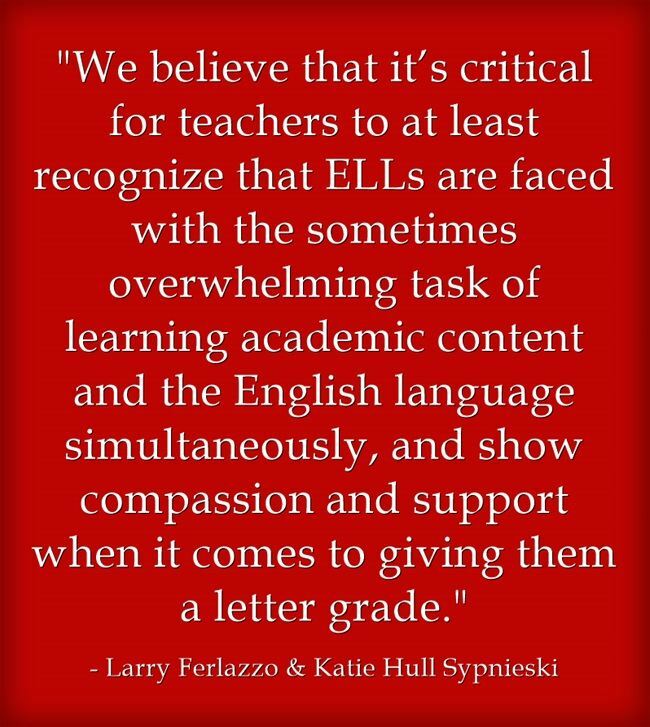 In those situations, we believe that it’s critical for teachers to at least recognize that ELLs are faced with the sometimes overwhelming task of learning academic content and the English language simultaneously, and show compassion and support when it comes to giving them a letter grade. We should always strive towards creating the world as we would like it to be. However, that doesn’t mean we should act oblivious to how the world is at the present time. Another option some districts use is to apply Pass/Fail grades to ELLs in content classes or to provide letter grades indicating accommodations were made (though those notations can appear on report cards, they may not be able to be added to formal transcripts). The lives of many of our English Language Learners, who have been uprooted from their home, culture, and native language through no choice of their own, can be very difficult. Let’s not make it harder. Instead, let’s demonstrate good sense, compassion and respect good educational practice. Let’s treat them as we would like our own children to be treated if we had been uprooted to a new country, a new culture and a new language. As a middle grades teacher, I can attest to the fact that grading ELLs is not as clear-cut as it may be for English speaking students. One of the ways I structure my grading is by using the WIDA Can-Do descriptors as my benchmark for grading practices. I would never try to grade an essay written by a Level 1 student with the same rubric that I use for other students. If my ELL students consistently made progress toward goals that are just above their present level of performance, how is that different from a “B” student going to an “A” student? While ELLs may be seen as under-performing based on standardized tests, I know at the end of the year that, in many instances, they have shown more growth than their English-speaking peers. Sadly, not many teachers agree with my philosophy. They hold out-dated beliefs that an “A” is an “A” and a “F” is a “F”. Some teachers still believe that assigning the lower score will push the student to work harder! While I realize that most teachers are more progressive with their ideology and praxis, this is still an issue in some classrooms.